Quick get all the frozen desserts made fast, we seem to be having some lovely warm weather here in Scotland this week so I intend to make the most of it while I can. Or could it possibly be that summer has arrived, na I doubt it. We even had a barbecue at the weekend which was very do it yourself made from an old roasting tin and balanced on an upside down camping stool, we were desperate but it worked a treat. 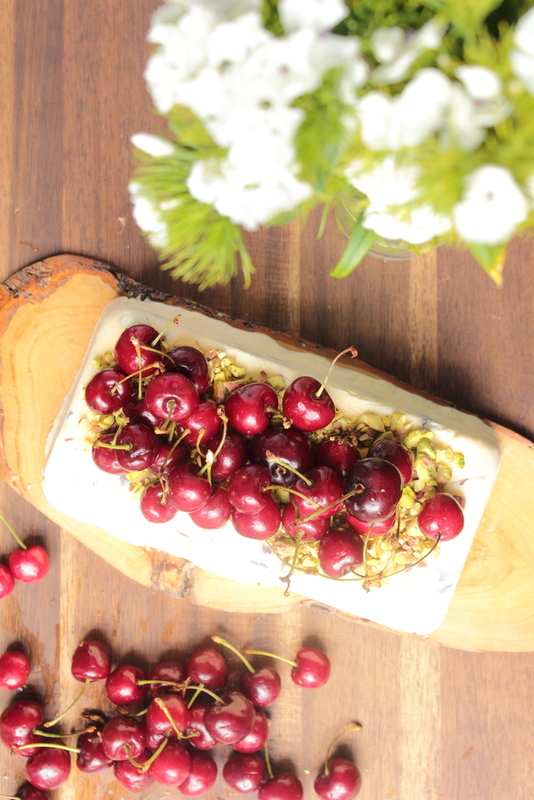 This cool, creamy cherry semifreddo was the perfect treat to follow our barbecued sausages. As you may already know I don’t own an ice ream maker so I opted to make a semifreddo as there is no churning required. 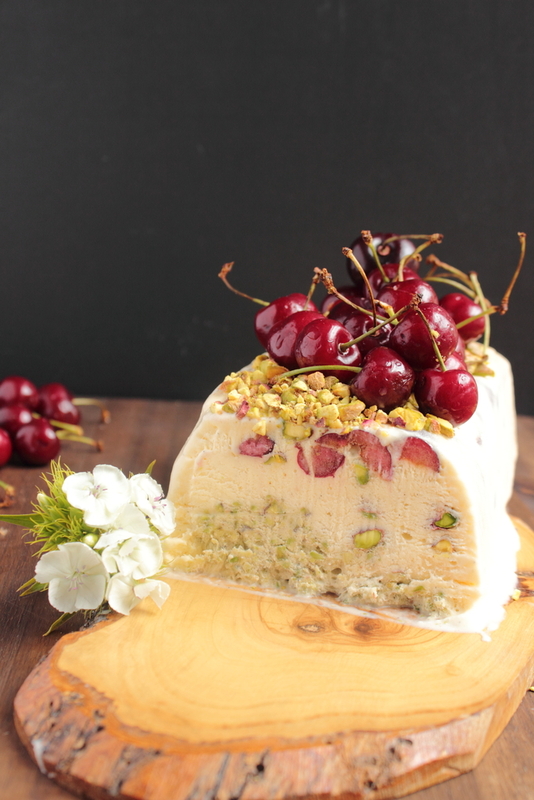 Semifreddo is an Italian desert and as you may have guessed means semi frozen so it needs to be thawed slightly before eating. The egg whites make the texture quite mousse like which I really enjoyed. 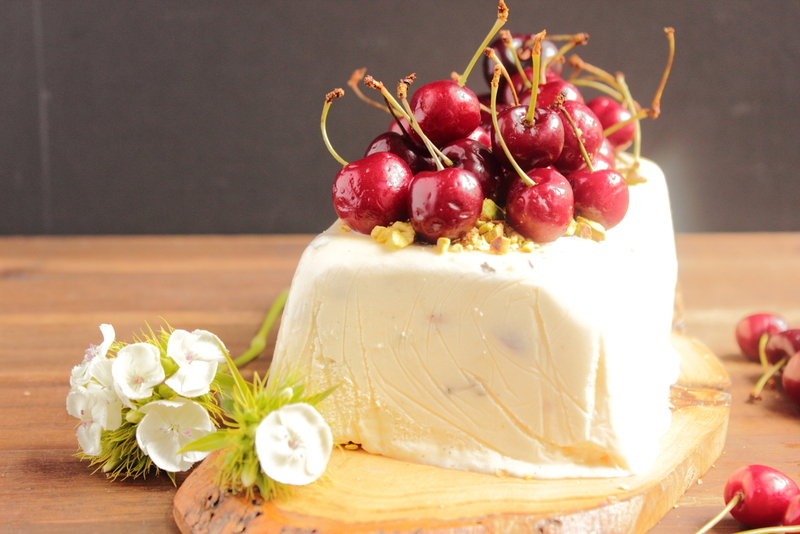 I chose cherries as they are perfect to start off the summer and there seems to be an abundance of them this year making them really reasonably priced. These cherries were so juicy and ripe they stained my lips and fingers. To add a little nutty, crunchy texture I also added some pistachios. I use pistachios in everything as you may have already noticed, I just love them and cant resist adding them wherever possible. I hope your enjoying some warm weather in your this side of the world. 1. Line a loaf tin with cling film. 2. In a bowl mix together the egg yolks, sugar and vanilla until combined. 3. In a separate bowl whisk the egg whites until forms soft peaks. 4. In another bowl whip the double cream. 5. Fold the cream into the egg yolk mixture and then fold in the egg whites until all combined. 6. Now blitz the pistachios in a blender so roughly chopped. 7. 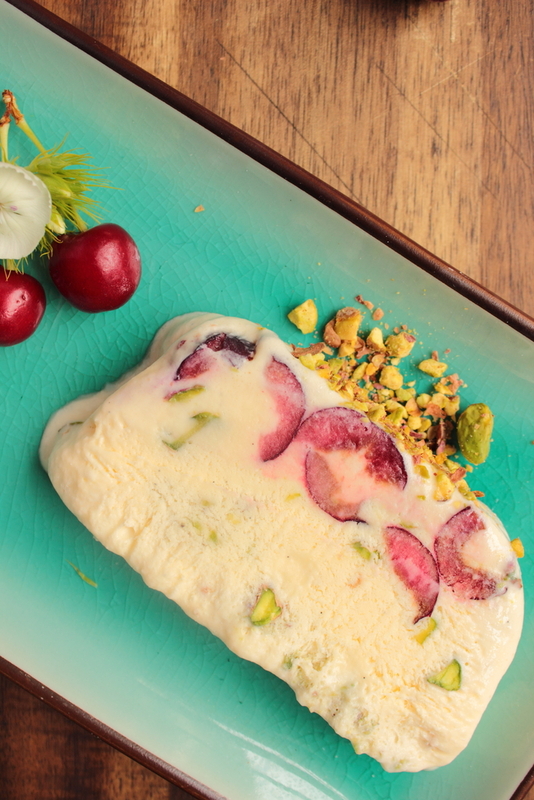 Add the destoned cherries and pistachios to the semifreddo mixture, set some cherries aside to decorate. 8. Pour the mixture into the loaf tin and cover in cling film. Freeze over night. When ready to serve leave out for 20 mins to thaw slightly and then slice.